Christmas Stitch-A-Long Part 3 [J1342] - $3.00 : Yarn Tree, Your wholesale source for cross stitch supplies. Cross stitch pattern from Tiny Modernist. Part 3 of 3 in the Christmas Stitch-A-Long mystery series Stitch count is 127h x 167w. Mrs. Claus, a snowman, and a squirrel have wrapped some gifts. Evergreen trees have been decorated with lights, ornaments, and stars. Snowflakes fill the sky. 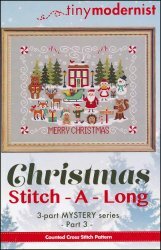 Companion piece to C8893 Christmas Stitch-A-Long Border & Text and G8936, G8936 Christmas Stitch-A-Long Part 1, and D8940 Christmas Stitch-A-Long Part 2.